The RECREATE Policy Brief no.4 examines the case of Nature-Based Solutions (NBS) in two different application areas: (1) coastal protection and (2) urban drainage systems. It is based on one of the detailed narratives carried out for the RECREATE project. The RECREATE Policy Brief no.4 is available for download. 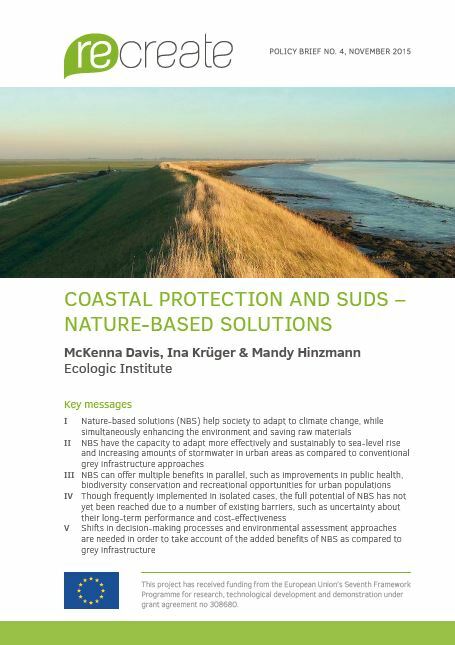 Davis, McKenna; Ina Krüger; Mandy Hinzmann 2015: Coastal Protection and Suds – Nature-based Solutions. RECREATE Project Policy Brief No. 4. I What is the problem? What is the suggested innovative solution?